From Daily Mail: NASCAR Xfinity driver Conor Daly has lost one of his sponsors because of a racial slur made by his racing driver father in the 1980s before he was even born. Lilly Diabetes said in a statement on Friday that it was pulling sponsorship of Conor’s No.6 car in the NASCAR Xfinity race at Road America, citing the racially insensitive remark made by his father Derek Daly that surfaced this week. The company said in a statement that its sponsorship was intended to raise awareness for treatment options and resources for people living with diabetes. ‘Unfortunately, the comments that surfaced this week by Derek Daly distract from this focus, so we have made the decision that Lilly Diabetes will no longer run the No. 6 at Road America this weekend,’ Lilly said. 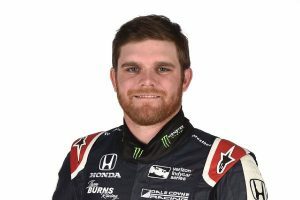 Primarily an IndyCar driver, Conor will make his NASCAR debut at the rural Wisconsin road course on Saturday with Roush Fenway Racing. ‘The last (24 hours) have been quite an unnecessarily difficult ride for my family. There is A LOT I want to say… but I’m still here and still racing,’ Conor wrote on Twitter on Friday night. He found himself caught up in controversy this week after his father Derek and Indianapolis Colts radio voice Bob Lamey both admitted to using the N-word. The elder Daly, who is a former Indy 500 and Formula One driver, was fired from his job as a WISH-TV racing analyst this week following the news that he had used the N-word in an interview 30 years ago. It resurfaced after longtime Indianapolis Colts radio voice Bob Lamey used the word during a training camp last week as he retold the story of Derek’s radio interview from the 1980s. Lamey abruptly retired in the wake of the comments. In a statement, Derek said he admitted to using the slur during the interview. Derek, who had just moved to the US at the time, said the term had a different meaning and connotation in his native Ireland. He said he was ‘mortified’ when he learned how the term was used in America and has never used it since then. His 26-year-old son wasn’t born when he made the comment. ‘Finally, I want everyone to know I deeply regret and sincerely apologize for what I said more than three decades ago,’ the elder Daly said in his statement. Lilly Diabetes is still sponsoring the RFR-owned cars of drivers Ty Majeski and Ryan Reed at Road America. ‘We remain committed to our mission of supporting people with diabetes,’ Lilly said. Conor thanked Roush Fenway and Twitter followers for their support in the wake of the controversy. He also thanked his former sponsor. ‘Lilly Diabetes has been a big part of my career and I’m very thankful,’ Conor wrote. UPDATE: The driver accused of killing Indianapolis Colts linebacker Edwin Jackson and Uber driver Jeffrey Monroe was an undocumented immigrant who used a fake name and has been deported twice in the past. Indiana State Police detectives have determined the driver was 37-year-old Manuel Orrego-Savala, a citizen of Guatemala. He gave police the alias Alex Cabrera Gonsales after the early Sunday crash that killed Jackson and Monroe. Officials said he had been deported in 2007 and in 2009. Original story: Indianapolis Colts player Edwin Jackson and an Uber driver were both killed early Sunday after being struck by a suspected drunken driver along Interstate 70. According to the Indiana State Police, the crash happened shortly before 4 a.m. Sunday along the westbound lanes of I-70, just west of Holt Road. Police said Jackson and 54-year-old Jeffrey Monroe of Avon were standing near a stopped vehicle when a black Ford F-150 pickup truck drove onto the emergency shoulder and struck them both. From Yahoo: On a day that ended in gunfire and tragedy at a country music festival in Las Vegas, Sunday also saw continuing controversy with NFL players kneeling before games, more standing, locking arms, and some sitting during the national anthem. Several members of the Seattle Seahawks chose to sit before Sunday Night Football kicked off, while the Indianapolis Colts decided to link arms in a show of unity for equality and racial justice. The result saw the Colts crushed as the Seahawks overcame early struggles (the Colts led the game at halftime) and scored a blowout 46-18 win. Whether it was politics or the final score or a mix of both, it was no victory for NBC and the NFL. With a 11.0/19 in metered-market results, SNF was down 5% from last week when the Washington Redskins beat the Oakland Raiders 27-10. As the league took another week-by-week ratings hit just a month into the 2017-18 season, Sunday’s game also was down a bit year-to-year. Compared with the then-season-low of the Pittsburgh Steelers’ 43-14 smackdown of the Kansas City Chiefs in primetime on October 2, 2016, last night’s SNF dipped 2% in the early numbers. On a night of competition on the other nets, that 2016 game ended up with a 6.7/22 rating among adults 18-49 and 18.06 million viewers. Against the debut of Star Trek: Discovery and more, last week’s 8:30-11:15 PM ET Redskins-Raiders battle saw a final numbers of 6.3/23 in the key demo and a total audience of 17.48 million. Now, blowouts usually always pour cold water on NFL ratings, and all things considered, last night’s MM numbers held up OK. However, with the politics that have become such a watched player in their own right in the past few weeks, the league might be close to having reached a tipping point. Barely ahead of last year’s struggling season in the ratings, the big-money NFL now finds itself losing traction in the numbers and public perception.